Read about "Frank Talk on Public Speaking"
Have YOU wished you could be a better leader? Do you yearn for better communications skills? Have you sometimes thought motivating volunteers was like herding cats? Would you find it beneficial to improve your leadership skills in Rotary and in your career? You NEED Frank Talk on Leadership! Search on Google for “leadership” and you will find an astounding 163,000,000 results! So what is leadership? Why is it important? And how can we at once become better leaders of our various groups of volunteers in Rotary—while at the same time using the advantages of Rotary membership to become better leaders in our business, professional, and community activities? This, the 4th in the best-selling Frank Talk series, tells you how! Now you can follow the lives of three ordinary Rotarians who have risen through the ranks of their Rotary clubs and districts and struggle to know how to be better communicators, motivators, and leaders—among other Rotary volunteers, and in their professional lives. These pages are filled with real-life examples of how to overcome the challenges each one of us faces every day. More than 200,000 Frank Talk books have been bought in 9 languages. No Rotarian’s library will be complete without this latest version. Look at how you can save money by ordering copies for each member. *The four titles can be combined, in lots of 25, and still receive this rate for orders totaling 100 or more. Prices are in US$. Just look at some of the praise for "Frank Talk on Leadership:"
"Several Past Presidents of Rotary International have contributed greatly to the history and spread of Rotary through their writings. Several, including Paul Harris, have published books and articles that have been of immense value to Rotary. One of the more prolific has been our 2000-01 President, Frank Devlyn, assisted by noted Rotary historian David Forward. Working together they have prepared a new book entitled Frank Talk on Leadership. This book is most timely because the 2007 Council on Legislation adopted Leadership as one of the core values of Rotary. The book offers much for any reader but it is particularly appropriate for a member of any volunteer organization. It explains how a leader, in such situations, has no real power but must rely on his or her ability to inspire or persuade. It goes further in providing a Leadership Self Evaluation section that includes all the right answers providing the reader is willing to put them into play. I strongly recommend that all Rotarians read this book but I suggest that it is a must for new members and incoming officers, be they at the Club, District, Zone or International level". 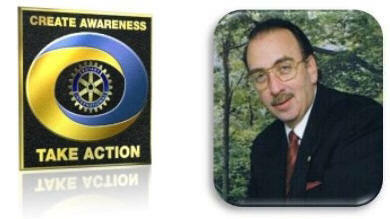 "Through his books, Frank Devlyn has become the master marketer of Rotary International and its Foundation. He is a man of the 'Streets of the World". Everywhere he travels he makes it his business to talk to people on the streets who are not Rotarians and very few of them ever will be. To those people his message is always the same. It is about Rotarians doing good in the world. It is about Rotary's message of hope for a world in need. "Frank Devlyn is a leader: when Franks talks, people listen, because his message always inspires you to take the initiative and serve others. Rotary is all about servant leadership--one of the traits described in this book. If you thought Frank was going to tell you what to do each time he met you, you would avoid him; the magic is that he encourages and inspires others to do their best. These are the qualities of effective leaders in both the corporate world and the voluntary sector and I know we all will benefit from the lessons in this book." Malcolm S. Morris, Chairman, Stewart Title Company. “Frank Devlyn in Rotary and in life is described by Theodore Roosevelt in the following statement: ‘Far better to dare mighty things, to win glorious triumphs, even though checkered by failure, than to rank with those poor spirits who neither enjoy much, nor suffer much because they live in the great twilight that knows not victory nor defeat.’"
"This book is a refreshing change from the typical business text and self-help book. Frank Devlyn's storytelling style keeps readers engaged while thought-provoking questions and revelations enable them to increase their success, personal growth and understanding of leadership and management."